(Phys.org) -- Nighttime is the astronomers day. After all, anyone wishing to see the stars must wait until it is dark. There is one exception to this rule, however: the sun. Close up, it can be used to study not only the properties of a typical star, but also its relationship with the planets. Observing eruptions of matter, sunspots or even the solar magnetic field in detail requires telescopes with a large aperture, such as Gregor, which will be inaugurated in Tenerife in the coming days. With a mirror diameter of 1.5 metres, the telescope will be able to show structures on the sun on spatial scales as small as 70 kilometres, making it one of the three most powerful instruments in the world. Tenerife is not just a popular destination for holidaymakers. Astronomers have also long since discovered the appeal of the Canary Island. Observation conditions are ideal on the plateau at the foot of the 3,718-metre-high Teide volcano. A consortium of researchers from the Kiepenheuer Institute for Solar Physics, the Astrophysical Institute Potsdam, the Institute for Astrophysics Goettingen, the Max Planck Institute for Solar System Research and other international partners have been constructing the Gregor solar telescope there since 2000. The name is not an acronym; the telescope is named after James Gregory (1638 to 1675). During the 17th century, the Scottish mathematician and astronomer developed a telescope in which a secondary concave mirror directed the reflected light from the primary parabolic mirror through a tiny hole in the primary mirror on to the eye-lens and thus into the eye. This optical principle is also used in the new telescope in Tenerife. However, it is unlikely that any scientist will use GREGOR to look directly at the sun; this will be done using electronic detectors, such as spectrographs, polarimeters, interferometers and cameras. The high-tech eye in the sky also differs in other ways from James Gregorys design. The telescope has a completely open structure to prevent air turbulence in the optical path. It is housed in a building with a retractable dome. The 1.5-metre primary mirror is made from the heat-resistant glass ceramic Zerodur and is actively cooled to prevent the surface of the mirror from heating up as a result of the absorbed sunlight. Engineers manufactured two additional mirrors from silicon carbide (Cesic). Thanks to its adaptive lens, GREGOR delivers particularly sharp images: a complex system of actuators and mirrors helps the system to compensate for the schlieren within the earths atmosphere, which constantly distorts the image of the sun similar to the way in which swirling air masses shimmer over an asphalt road in the summer heat. A rotating fold mirror deflects the bundled beam generated by the adaptive optics system to the various instruments. Their purpose is to measure various physical solar parameters with an unprecedented level of precision, in particular the suns magnetic field, and in doing so reveal small structures down to a scale of 70 kilometres  an astounding resolution capacity given that the sun is located approximately 150 million kilometres from the earth. The complex magnetic field is crucial to almost all processes in and on the bubbling ball of gas that is the sun. It is responsible for the energy balance of the outer layers of the atmosphere, it plays a role in the solar activity cycle (the occurrence of sunspots follows an eleven-year rhythm) and it produces most of the sometimes-spectacular visible phenomena: solar prominences, flares, coronal mass ejections and terrestrial auroras. Researchers know, based on theoretical considerations and numerical calculations, that the interactions between the solar plasma and the magnetic field take place on very small spatial scales of approximately 70 kilometres on the sun. This is precisely the resolution achieved by GREGOR. The telescope observes the sun in visible and infrared light. In doing so, it focuses on the photosphere  a thin layer of gas (roughly 300 km thick) which appears to us to be the surface of the sun. Researchers also want to examine the chromosphere, which lies above this layer. They hope that GREGOR will help them to gain a better understanding of the above-mentioned solar phenomena. Ultimately, these new findings should help to provide more accurate forecasts about eruptions of matter, which can pose a risk to satellites in space or electricity grids on earth. GREGOR belongs to the Observatorio del Teide at the Instituto Astrofisica des Canarias (IAC). Although the telescope will be officially inaugurated on 21 May and will subsequently embark on its scientific work, it has already been through a baptism of fire: on 12 March 2009, GREGOR saw sunlight for the first time; at that time it was still fitted with a test mirror measuring one metre in diameter. 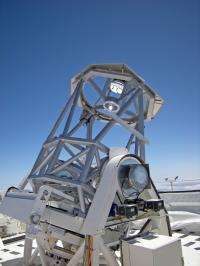 While the telescope at Teide in Tenerife is sure to shed light on solar physics in the coming years, it also has something to offer traditional astronomers: thanks to its outstanding optical and mechanical properties, they will be able to use GREGOR to examine sun-like stars in long series of measurements, something that is not possible with other night telescopes.